This piece is part re-enactment of the birth of Jesus, part church service, and part Christmas concert, composed of gospel versions of traditional carols mixed with a few original tunes as well. Patmon’s conceptualized version is a testament to the power of gospel music and the story of the Nativity told through the combination of scripture, poetry, dance, and songs that connect today to the time of mangers and swaddling cloths. Each joyous performance brings the real meaning of faith and love to life for the entire family. “It is exciting to produce such an historical play,” Director Charles W. Patmon, Jr. said. 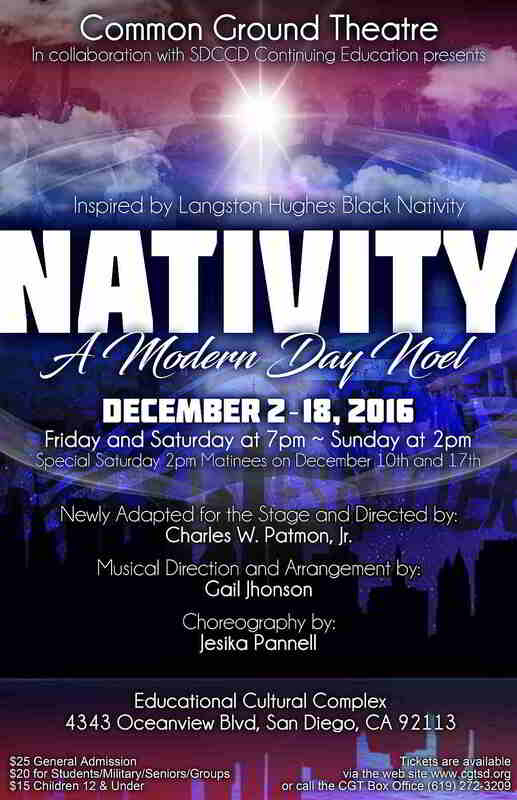 “Because Common Ground Theatre, the oldest African American theatre arts company in San Diego and among the three oldest in the United States, celebrating 53 years of theatre excellence, we bring “Nativity” back to the stage to continue to honor the legacy of playwright Langston Hughes and CGT’s late legacy director, Dr. Floyd Gaffney. This year, we have incorporated many of CGT’s San Diego Theatre Artist Repertory School (STARS) participants to add to the spectacle and creativity of the production.” ” CGT’s mission is to produce classics and new works by and about people of African descent that entertain, educate, and connect with audiences of all ages, cultures, and backgrounds. Its purpose is to produce high quality theatrical productions that offer a “common ground” where people of all ages, cultures, and backgrounds can interact, connect and share their love of theatre. CGT envisions a culturally diverse, socially relevant, and politically aware theatre organization that nurtures the expertise of amateur and professional artists alike and improves community relations among diverse cultures and underrepresented groups. Common Ground Theatre is supported by the San Diego Community College District Continuing Education Division, the San Diego County Community Enhancement Program, the Jacobs Center for Neighborhood Innovation, and generous donations from individuals and organizations. A portion of the proceeds from the production of “Nativity: A Modern Day Noel” will provide scholarships for students to attend Common Ground Theatre’s San Diego Theatre Artist Repertory School (STARS) program. The STARS program is an initiative created by Common Ground Theatre to build community through the arts by providing students of all ages and abilities with professional and affordable instruction in the performing, fine, and visual arts. For more information regarding the STARS program, please contact Common Ground Theatre at (619) 272-3209 or write to Common Ground Theatre at P. O. Box 152443, San Diego, CA 92195 or cgtheatre1@gmail.com. PERFORMANCES: Educational Cultural Complex, 4343 Ocean View Blvd., San Diego, CA 92113, on the following dates: Fridays, December 2nd, 9th, and 16th, at 7:00 p.m.; Saturdays, December 10th, and 17th, at 2:00 p.m. and Saturdays, December 3rd, 10th, and 17th 7:00 p.m.; and Sundays, December 4th, 11th, and 18th, at 2:00 p.m.
PRICES: $25 General Admission; $20 Students/Military Seniors/Groups; and $15 for children ages 12 and under. For information and tickets, contact Common Ground Theatre Box Office at (619) 272-3209; Group Ticket Coordinator Ms. Williams at (619) 315-6132; or online purchases at cgtsd.org. This author has not yet submitted a bio. This post is missing your voice. Leave a comment. Subscribe to our newsletter by filling the form below. We will send you notifications when new events are planned at Common Ground Theatre. Copyright © 2012, 2013 Common Ground Theatre. All rights reserved.